The U.S. simply can’t get enough crossovers. It’s the industry’s largest segment, and automakers are responding to demand with new and updated products at an increasingly feverish pace. Such is the case for Toyota and its hugely popular compact SUV, the RAV4. Currently in its fourth generation, the RAV4 receives a mid-cycle update for the 2016 model year, and per the new normal, the changes are far from minor. Styling tweaks, renewed infotainment equipment, the latest suite of safety technology, and a new sporty SE trim level are all on the menu, but the biggest news by far is the addition of a hybrid drivetrain. 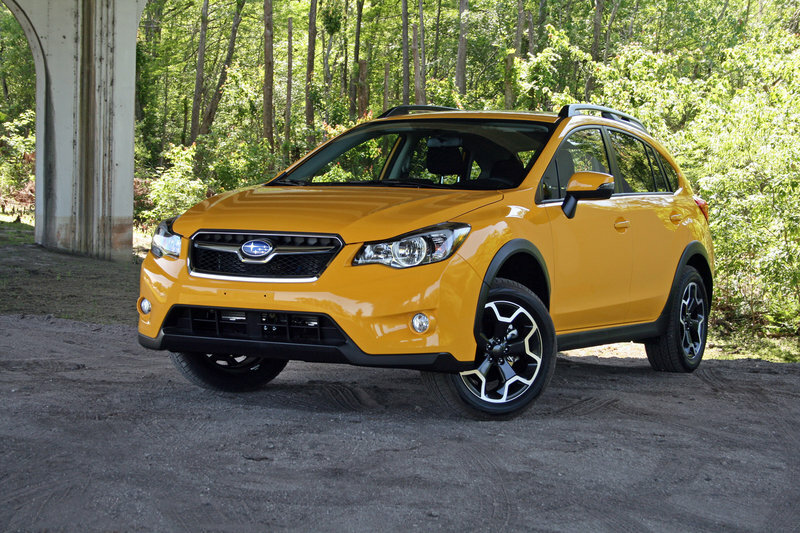 Perpetual development between generations is critical for a model like the RAV4. Competition is at an all-time high, and fresh ideas are needed to stay at the forefront. Of course, the basics remain the same – the 2016 non-hybrid RAV4 gets the same engine, horsepower, torque, transmission, suspension layout, brakes, mpg figures, interior volume, and cargo space as the outgoing model. Rather than messing with what already works, Toyota seems focused on broadening the RAV4’s appeal, a strategy echoed by the 2016 Prius. Does this bestseller have what it takes to rope in ever more buyers? I went to southern California to find out. 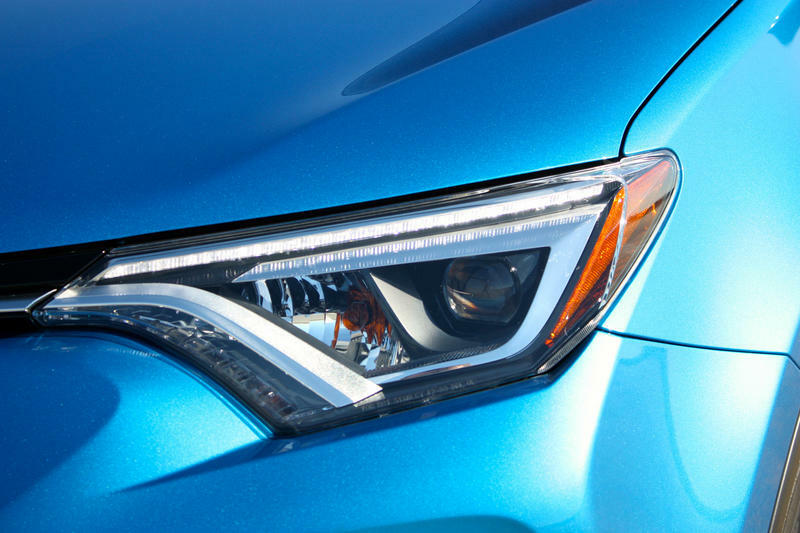 Continue reading to learn more about the 2016 Toyota RAV4. Toyota claims it created the small SUV segment with the release of the original RAV4. While the validity of that statement is certainly up for debate, the RAV4’s influence is absolutely undeniable. In 1989, Toyota released the “RAV Four Concept,” but it wasn’t until 1994 that the first production RAV4 made its way to customers in Japan and Europe. Two years later, it was released in North America. Body styles for the first generation included three-doors, five-doors, and surprisingly, a three-door soft top. In 2000, Toyota announced the second generation, phasing out the soft top, but keeping both the three-door and four-door body style (U.S. customers only got the five door). In 2003, the RAV4 got a mid-cycle update that included standard vehicle stability control and a new 2.4-liter engine to replace the outgoing 2.0-liter unit. 2005 saw the introduction of the third-generation vehicle, bringing a new platform and electric power steering. The five-door variant became the only body style available in each market, but a short-wheelbase model was offered in Japan, Europe, and New Zealand. 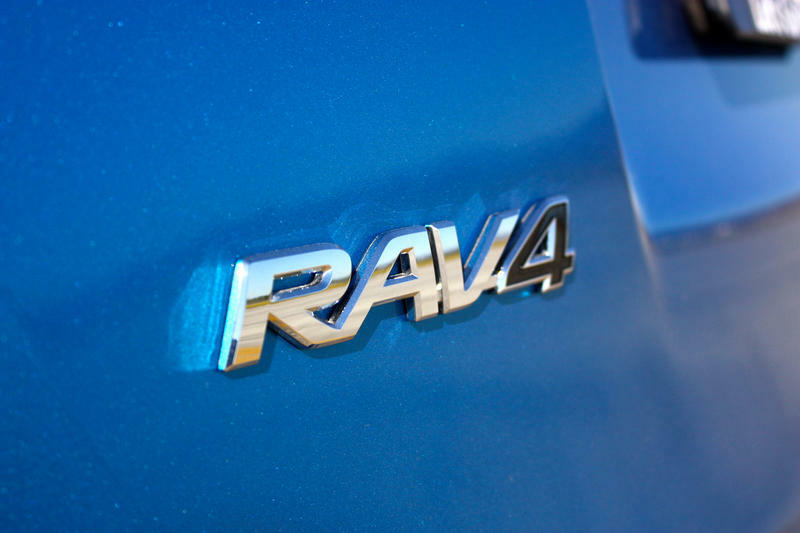 Finally, in late 2012, the fourth-generation RAV4 was revealed at the Los Angeles Auto Show, eventually going on to win a variety of awards from various consumer organizations. That brings us to the 2016 model-year update, which aims to highlight Toyota’s new safety technology, usher in the new SE trim level, update the exterior to be more SUV-esque, enhance the interior feel and ride quality, and introduce the new hybrid model. Since its introduction in the mid-‘90s, Toyota has sold 2.4 million RAV4s, 80 percent of which are still on the road today. 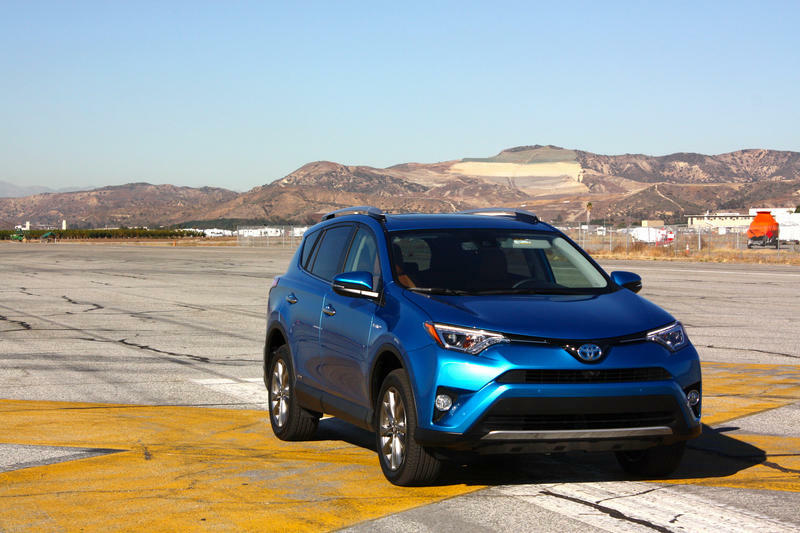 The RAV4 hybrid makes for Toyota’s eighth hybrid model, but interestingly, this isn’t the first time Toyota has stuffed an alternative drivetrain into its compact SUV. An all-electric plug-in variant of the first-generation vehicle was produced between 1997 and 2003, with 1,484 units either leased or sold in California. Then between 2012 and 2014, Toyota produced an all-electric variant of the third-generation RAV4 using a drivetrain sourced from Tesla, selling 2,489 units total. 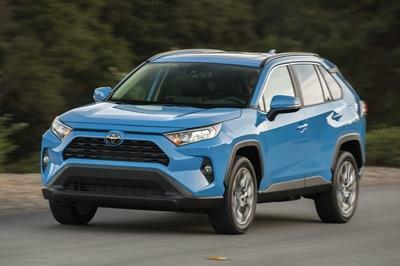 To help the RAV4 adopt a more traditional, SUV-like look, Toyota fine-tuned the lines front to back, with the most obvious changes seen in the front fascia. New styling is present in every panel from the hood line down, with a raised nose, reshaped bumper, and a higher stance. The headlights are now slimmer, as is the upper grille. The lower, trapezoidal grille is larger, and wraps around to lend a feeling of increased width. At the bottom is a skid plate garnish, now standard across the line. The raised nose continues into a high beltline in the vehicle’s profile. The fenders and rocker moldings are altered, and roof rails are now standard on all trim levels. In the rear, the taillights were reshaped to complement the high beltline and raised stance, while the bumper replaces black plastic molding with body-colored panels. The backup lights are now in the lower corners of the bumper, and a rear skid plate is standard. Up top is a shark fin antenna. 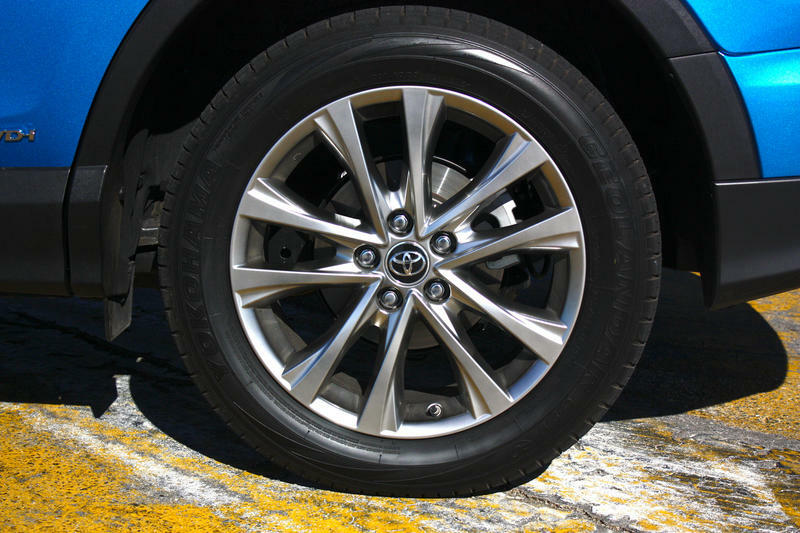 Wheel options include five different styles depending on trim level, and include 17-inch steel units, 17-inch alloys, and 18-inch alloys. 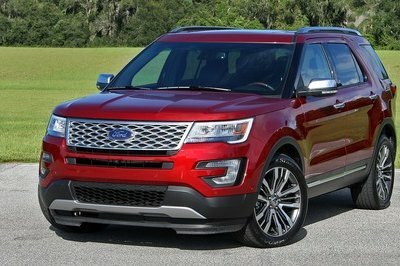 The sportier SE trim level gets a few unique styling cues, such as an exclusive honeycomb grille and a new bumper. Select exterior parts, such as the fog light bezels, upper grille, and mirror visors, come with a black luster, and a distinctive 18-inch wheel design can be found in the corners. LEDs are used for the headlights, daytime running lights, and taillights. While I’d certainly argue the new styling makes for a more SUV-esque appearance when put next to the outgoing model, I’m not sold on the look overall. Hybrid models also get their own unique touches, although on a much more subtle level than the SE. These include exclusive badging, and a new 17-inch alloy wheel design for the XLE Hybrid trim level. Paint options include Black Currant Metallic, Silver Sky Metallic, Hot Lava, Super White, Black, Blizzard Pearl, Barcelona Red Metallic, Magnetic Gray Metallic, Classic Silver Metallic, Black Sand Pearl, and my personal favorite, Electric Storm Blue. 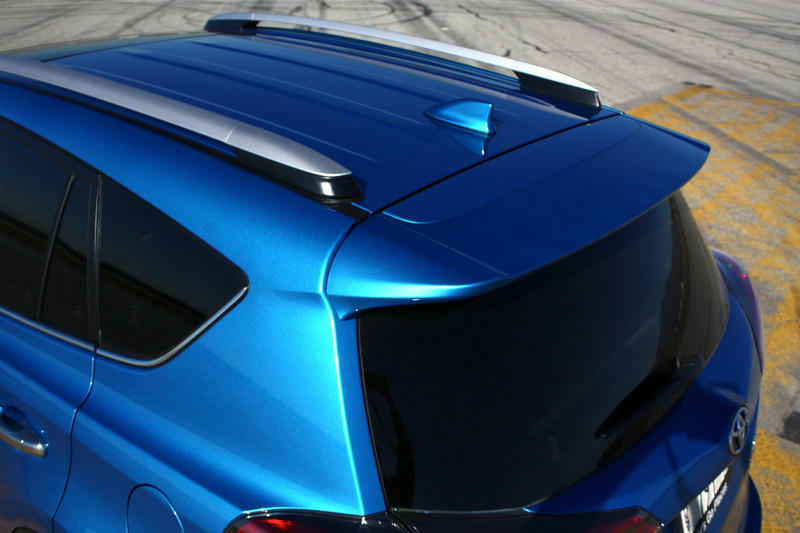 There’s also a two-tone paint option that combines complementary colors on the body and lower components. While I’d certainly argue the new styling makes for a more SUV-esque appearance when put next to the outgoing model, I’m not sold on the look overall. In particular, the hard lines and pinched front end is too angular for my taste. I think it works fine on a small, zippy, tech-oriented vehicle like the Prius, but for a crossover, I’d prefer something blockier, such as the styling seen on the new Toyota Tacoma. Dimensionally, the 2016 RAV4’s cabin is identical to the outgoing model, with passenger room, cargo volume, and seating capacity all unchanged. Meanwhile, the hybrid model gets slightly reduced cargo room, but still manages to maintain its essential crossover practicality with the addition of a smooth, easy-sliding ramp that guides cargo over the rear-mounted battery pack. Rear access is enhanced thanks to a height adjustable power liftgate with jam protection. This feature is standard on the XLE trim level and above, and offers six settings selectable from the driver’s seat. Interior volume: 136.3 cu. ft. Passenger volume: 100.7 cu. 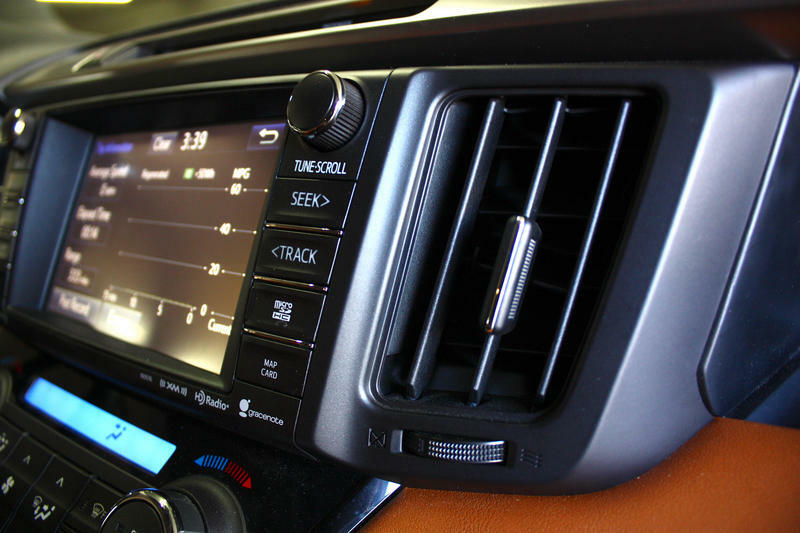 ft.
Toyota cut back on the number of hard buttons and switches by integrating more features into the infotainment system. Standard is a 6.1-inch touchscreen, while a high-definition 6.1-inch touchscreen and 7-inch touchscreen are optional. Models at the XLE trim level and above also get a new multi-information 4.2-inch color display screen in the gauge cluster – the same unit found on the new Camry, Sienna, and Highlander. Hybrid models get a Hybrid System Indicator integrated with the display to view fuel consumption and max out mpg. Navigation is available on all trim levels. Buyers can get Integrated Navigation at the higher trims, while lower trims are offered with Scout GPS Link app functionality. The Scout GPS Link app uses your smartphone to send navigation, traffic info, and more to the RAV4’s infotainment system. It’s controllable via voice recognition and the multi-function steering wheel. Other options include Smart Key, the Home Link garage opener, and SiriusXM radio with a complimentary three-month trial subscription. In total, there are four infotainment systems to choose from. Entry-level equipment includes AM/FM/CD, Bluetooth, iPod connectivity, a USB 2.0 port, auxiliary mini-jack port, voice recognition, six-speaker audio, and Siri Eyes Free. At the other end is the Premium Entune audio system, which includes 11 speakers in seven locations, 576 watts of power, eight channels, a Hi8 amplifier, two 6.69-inch subwoofers in the front, and a single 7.48-inch subwoofer in the rear. The speakers are from JBL, and use GreenEdge technology for low weight and low energy consumption – particularly important for the hybrid. The cabin also boasts new materials and more soft-touch surfaces, such as padding on the upper door armrest on higher trim levels. 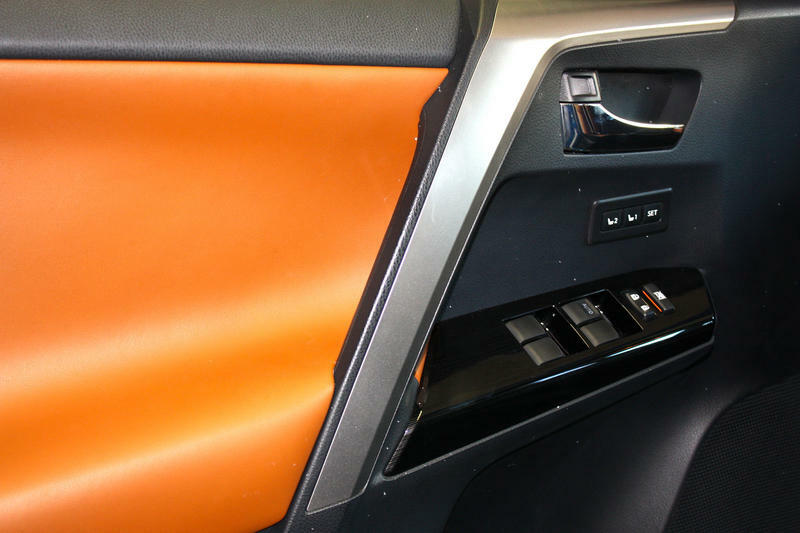 There’s standard LED illumination for the lower the lower center console across the line, plus a 12-volt power outlet in the rear, a revised cup holder, a new sunglasses holder, and privacy glass for the rear side, quarter, and liftgate windows. Interior color schemes include Black, Ash, Cinnamon (tan), and Nutmeg (beige). 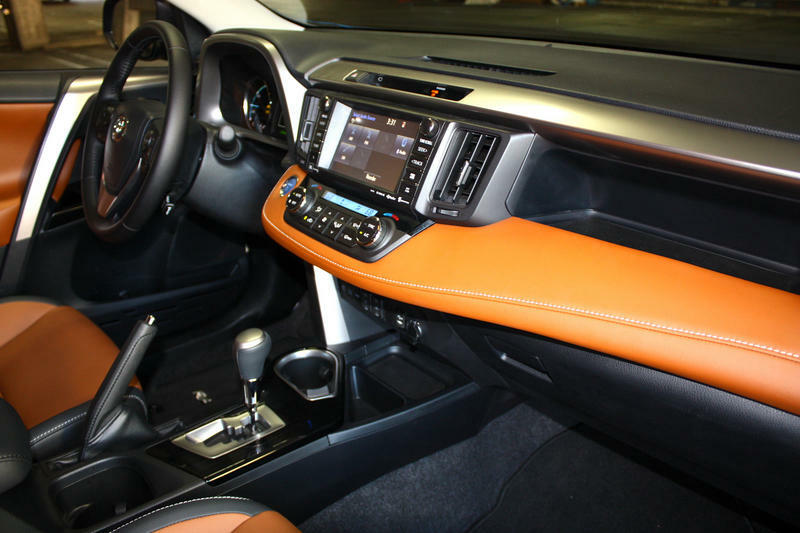 Overall, I liked the new RAV4’s interior. It was pleasant and upscale, even at the more spartan trim levels. Overall, I liked the new RAV4’s interior. It was pleasant and upscale, even at the more spartan trim levels. The leatherette material feels right, and the contrast stitching looks good. Customers won’t feel like they’re missing out on amenities. On the road, these changes are apparent and appreciated, and should make extended trips and commuting far less fatiguing in the long run. 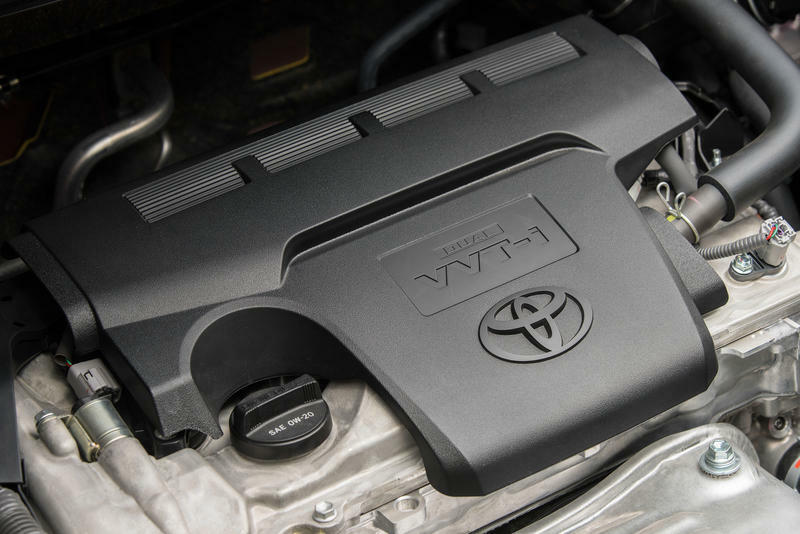 Motivating the 2016 non-hybrid RAV4 is a 2.5-liter, DOHC, 16-valve four-cylinder engine with VVT-i variable valve timing technology – the same powerplant found in the outgoing model. Output is rated at 176 horsepower at 6,000 rpm and 172 pound-feet of torque at 4,100 rpm. Routing the power is a six-speed electronically controlled automatic transmission, with FWD equipped as standard and AWD offered as an available option. When equipped with AWD, non-hybrid RAV4s use the same system as the Toyota Highlander, pulling info like vehicle speed, steering speed, steering angle, throttle angle, and yaw to calculate optimal torque distribution and maximize traction. Torque distribution can vary between 100 percent front/0 percent rear, and 50 percent front/50 percent rear. To help sharpen handling response, there’s Pre-Torque Control, which sends power to the rear as soon as you turn the steering wheel. The system will default to FWD to boost fuel mileage during long-distance cruising. Below 25 mph, the system can also be locked at 50 percent front/50 percent rear if desired. Driving modes include Eco and Sport, altering things like climate control settings, shift timing, throttle response, and (if equipped) AWD torque distribution for unique driving characteristics. These are more than a gimmick – they really do make a noticeable impact on feel and fuel returns. Mileage figures are estimated at 24 mpg city/31 mpg highway/26 mpg combined for FWD models, and 22 mpg city/29 mpg highway/25 mpg combined for AWD models. A sprint to 60 mph takes 9 seconds. Now for the big news – the hybrid drivetrain. Internal combustion once again comes from a 2.5-liter four-cylinder engine, while a nickel-metal hydride (Ni-MH) battery and two electric motors provide the electrification. One electric motor is used to drive the front wheels, while the other is used to drive the rear wheels, delivering either FWD efficiency, or AWD grip as the situation dictates. If this all sounds similar to the Lexus NX, it’s because it’s more or less the same drivetrain components. Fuel mileage is boosted to 34 mpg city/31 mpg highway/33 mpg combined, figures that Toyota can boast as being best-in-class. Output from the hybrid system is rated at 194 net horsepower and 206 pound-feet of torque – 18 horsepower and 34 pound-feet more than the non-hybrid RAV4. Consequently, acceleration is improved, dropping the 0-to-60 mph time down to 8.1 seconds, making the hybrid the fastest RAV4 of the bunch. More importantly, fuel mileage is boosted to 34 mpg city/31 mpg highway/33 mpg combined, figures that Toyota can boast as being best-in-class. Several key components contribute to these mileage numbers, including an electronically controlled continuously variable transmission (CVT) and regenerative brakes. In addition to Eco and Sport driving modes, hybrid drivers can utilize EV mode, which allows for electric-only propulsion at speeds below 25 mph and distances up to 0.6 miles. While obviously limited in its usefulness, I’m still glad Toyota included EV mode – very short trips will no longer feel quite as wasteful. In addition to a quicker 0-to-60 mph time and better fuel economy, the RAV4 Hybrid can also out-tow its non-hybrid sibling, rated at 1,750 pounds compared to the non-hybrid’s 1,500 pounds. Anyone interested in hitching up a 2016 RAV4 will be interested to know that all models (excluding the SE) come standard with sway control, which applies brakes to individual wheels when trailers start to snake. Behind the wheel, I was less than impressed by the non-hybrid’s performance. Granted, this is a crossover we’re talking about, and acceleration isn’t necessarily at the top of the priority list. Even so, I felt like the power was lacking a little at the lower end of the rev range, and the engine took serious provocation to deliver the goods. Thankfully, the hybrid model fixes this with a solid dose of electric muscle as soon as you hit the throttle. The instant torque was noticeable and highly effective. Unfortunately, the hybrid comes with its own unique quibble – the transmission. I’ve never been a fan of any CVT, and unfortunately, the RAV4 doesn’t change that opinion in the slightest. There are six set ranges to give it a more traditional, stepped feel, but the result is still lackluster at best. The RAV4 once again uses an independent MacPherson strut suspension layout up front, and a double-wishbone suspension layout in the rear. New for 2016 are digressive valve shocks at all four corners, which handle high-frequency roads with ease, plus retuned coil springs. The speed-sensitive rack-and-pinion electric power steering was also retuned for more direct feel, and the rear suspension member has more spot welds for less vibration and more control. Finally, the brakes get a new ABS actuator for a more linear feel. My first impression was in the sport-flavored RAV4 SE, which brings unique suspension tuning for more excitement behind the wheel. As such, I took it out to a twisty canyon road to see what would happen if it threw a few corners. The results were surprisingly positive. 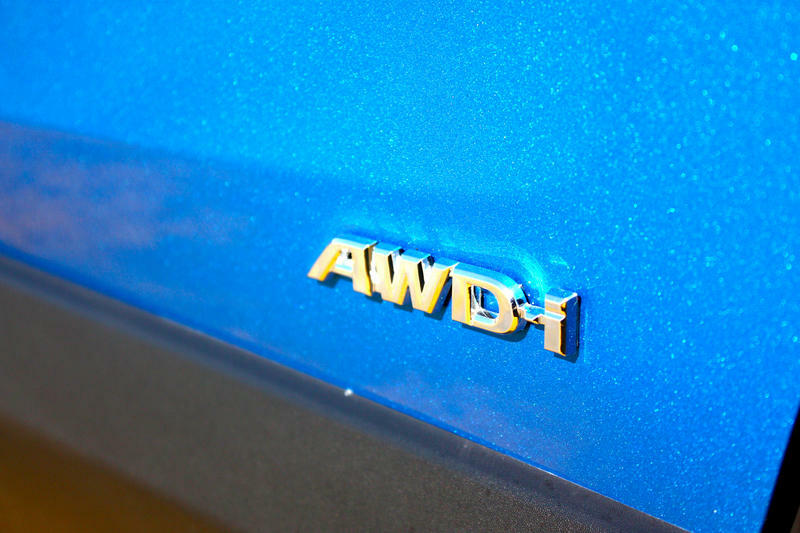 Despite being a tall, heavy, nose-scrubbing AWD crossover, the SE handled my spirited inputs with very little drama. The suspension managed the 3,630 pounds of curb weight in a predictable fashion, and at no point did it feel like it was going to bite back. To explore a little further, I took the SE out to an old airfield where Toyota had set up a small autocross course, giving me an opportunity to push much more aggressively. Predictably, terminal understeer and a lot of lean were more than apparent, but not to the extent that I had expected. While not necessarily athletic, the SE did feel more surefooted and car-like than the typical crossover. Would I take it to a real autocross event? No way. Will it put a smile on your face if you took the long way home? Absolutely. Just don’t expect any miracles. Of course, this elevated confidence in the twisties comes at the cost of bouncier, jostling ride quality, but that’s entirely expected considering its stated sporting mindset, and I wouldn’t rate it too harshly. Those looking for a plusher experience should instead go with the hybrid. While squishier and slushier through the cones, the hybrid was also far more comfortable, and the heavier, 3,900-pound curb weight works well when skimming down southern California’s cracked and broken highways. The electric juice was also quite nice, especially when launching from a standstill, although repeated runs did quickly drain the battery. What if you could have that low-end hybrid grunt and a sportier suspension set-up? While admittedly rather niche, it could provide a good deal of fun (if properly executed). I asked a Toyota rep about such a combination, and while he agreed it had the potential to be pretty interesting, he said nothing was planned for the time being. 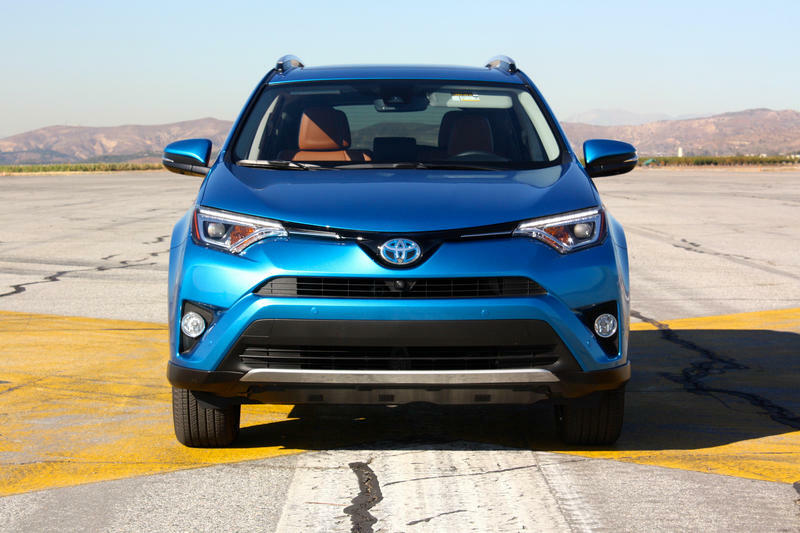 The RAV4 is one of the safest crossovers on the road. The National Highway Traffic Safety Administration awarded it five out of five stars in overall crash safety, with four out of five stars in frontal impacts, five out of five in side impacts, and four out of five stars in a rollover. You can check out the details here. 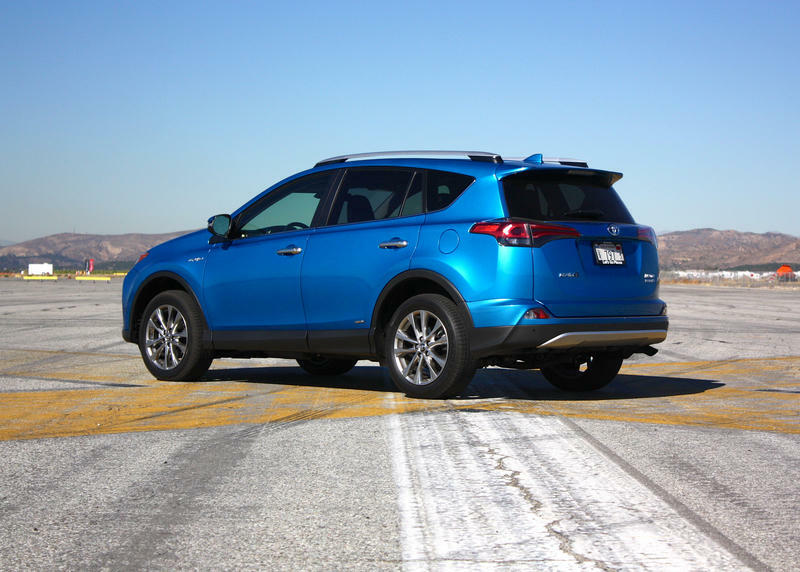 Meanwhile, the Insurance Institute for Highway Safety (IIHS) has yet to rate the 2016 model as of this writing, but awarded the 2015 RAV4 with its Top Safety Pick accolade, showing a maximum “Good” rating in every impact category (child seat anchor ease of use gets a “Marginal” rating). You can check out the details here. 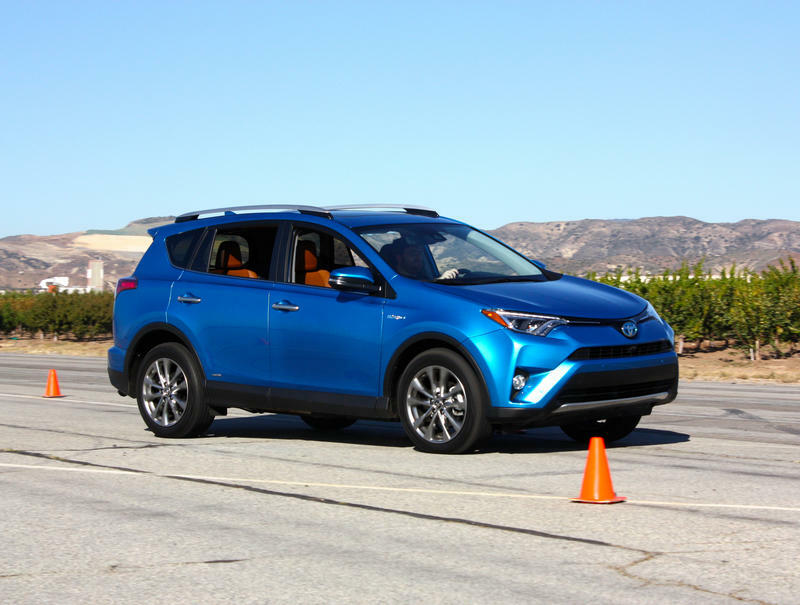 Standard safety equipment for the 2016 RAV4 includes eight airbags and two LATCH locations, plus the Star Safety System (stability control, traction control, ABS, electronic brake-force distribution, brake assist, and Smart Stop Technology). There’s also standard next-generation start assist, which uses yaw rate sensors to automatically recognize the vehicle is on a hill and prevent it from rolling. Blind-spot monitor, rear cross-traffic alert, and front/rear parking sonar are either available or standard depending on trim level. One of the coolest features has to be the available Bird’s Eye View Camera system, which stitches together four real-time images from externally mounted cameras to give the driver a high-definition panoramic view around the vehicle – particularly useful when maneuvering in and out of tight parking places. Toyota is currently rolling out its Toyota Safety Sense (TSS) safety suite, which is designed to prevent frontal collisions and lane departure, as well as enhance nighttime driving. The 2016 RAV4 is one of the premiere models to equip TSS, and almost all Toyota vehicles will see its inclusion by the end of 2017. First on the list of TSS features is a Pre-Collision System, which can detect possible frontal impacts with both vehicles and pedestrians. If an impending impact is detected, the system will issue a visual and audible warning to the driver. If the driver fails to react, the system will engage the brakes automatically to stop or reduce the vehicle’s speed before impact. Next is Lane Departure Alert, which will notify the driver with an audible and visual warning when the vehicle has strayed outside visible lane markings. TSS also includes Automatic High Beams, which detect oncoming and proceeding traffic and automatically switch between headlight high and low beams, maintaining increased visibility when possible while refraining from blinding other drivers. Finally, there’s Dynamic Radar Cruise Control, which monitors the proceeding vehicle’s distance to match its speed, slowing when necessary, and speeding up when possible. I got a chance to test TSS on the new Prius, and all told, it works as advertised. Check out the Prius review here and scroll down to the Safety And Convenience section for more details. 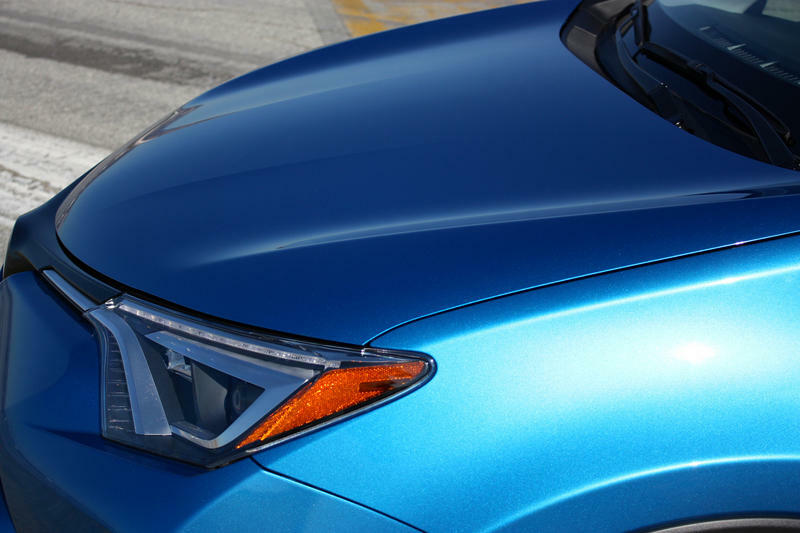 The 2016 RAV4 is in dealerships now, and is offered in six trim levels. There are also several available packages. Listed below are major features for each trim level and package (listed features are in addition to, or replacements of, previous trim level features). Automatic on/off headlights, daytime running lights, color-keyed rear spoiler, 17-inch steel wheels, sharkfin antenna, front and rear skid plate, power side mirrors with blind spot monitor, privacy glass, roof rails, backup camera with projected path, 3.5-inch LCD multi-information display, cruise control, multi-function steering wheel, voice recognition, Bluetooth hands-free calling and music streaming, keyless entry, illuminated entry, two 12-volt power outlets, Entune Audio with 6.1-inch touchscreen, AM/FM/CD, six speakers, auxiliary audio jack, USB 2.0 port, iPod connectivity. FWD models start at $24,350, while AWD models start at $25,750. Fog lights with chrome surrounds, 17-inch alloy wheels, powered and heated side mirrors with integrated turn signals and blind spot monitor, moonroof, height-adjustable power liftgate, dual-zone climate control, 4.2-inch TFT multi-information display, leather-trimmed multi-function steering wheel, Entune Audio Plus with Connected Navigation with 6.1-inch high-resolution touchscreen, Scout GPS Link, Siri Eyes Free, SiriusXM radio with 3-month trial subscription, HD radio, HD traffic and weather. 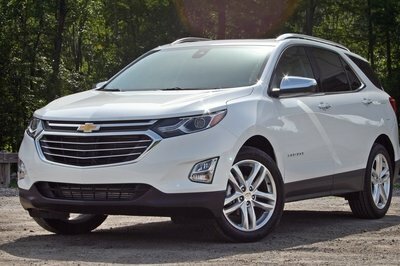 FWD models start at $26,270, while AWD models start at $27,670. LED headlights with automatic on/off, LED daytime running lights, LED taillights, 18-inch alloy wheels, unique front lower bumper and grille, powered and heated side mirrors with blind spot monitor in black, sport suspension, steering-wheel mounted paddle shifters, sport-trimmed shift lever with contrast stitching, SofTex upholstery, black headliner, blind spot monitor with rear cross-traffic alert, heated front seats, smart key system with push-button starter, remote power liftgate. FWD models start at $29,265, while AWD models start at $30,665. 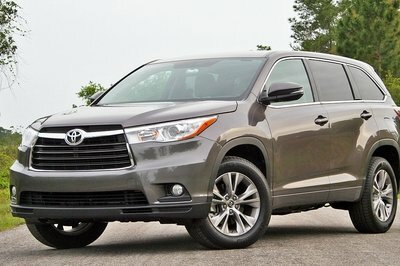 18-inch Superchrome alloy wheels, chrome door handles, color-keyed powered and heated side mirrors with integrated turn signals and blind spot monitor, frameless auto-dimming rearview mirror with Homelink, leather-trimmed shift lever, Toyota Safety Sense, Entune premium Audio with Integrated Navigation and App Suite, 7-inch high-resolution touchscreen. Halogen headlights with automatic on/off, halogen daytime running lights, 17-inch alloy wheels, color-keyed outside handles, EV mode, cruise control, fabric upholstery, Entune Audio Plus with Connected Navigation, 6.1-inch high-resolution touchscreen. LED headlights with automatic on/off, LED daytime running lights, LED taillights, 18-inch Superchrome alloy wheels, chrome door handles, SofTex upholstery, heated front seats, blind spot monitor with rear cross-traffic alert, Toyota Safety Sense, Entune Premium Audio with Integrated Navigation and App Suite, 7-inch high-resolution touchscreen. Available on XLE (hybrid and non-hybrid). Includes Smart Key System (only non-hybrid), blind spot monitor with rear cross-traffic alert, front and rear parking sonar, Entune Premium Audio with Integrated Navigation and App Suite, Toyota Safety Sense. Available on SE, Limited, and Limited Hybrid (features vary with trim level). Includes Bird’s Eye View Camera with Perimeter Scan, front and rear parking sonar, Entune Premium JBL Audio with Integrated Navigation and App Suite, Toyota Safety Sense. 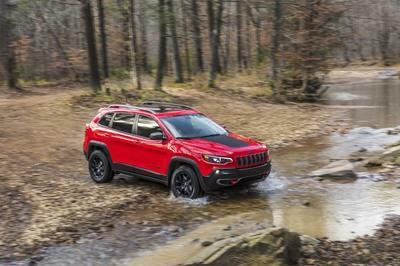 Don’t call it a wagon – this jacked-up off-roader offers standard AWD and almost 9 inches of ground clearance, trouncing the RAV4’s maximum of seven inches. Under the hood is a 2.0-liter flat-four powerplant with 148 horsepower and 145 pound-feet of torque. Opt for the hybrid version, and you’re looking at 30 mpg city and 34 mpg highway. 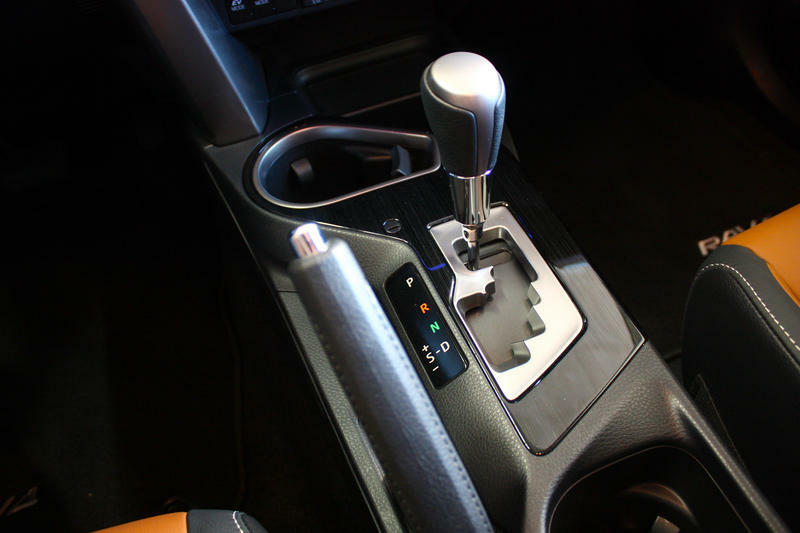 Transmission options include a five-speed manual and a CVT. Pricing starts at $21,595. Toyota may offer the RAV4 SE, but anyone looking for a little more fun is encouraged to check out the CX-5. The exterior Kodo styling looks good and the interior is upgraded with a premium fit and finish, but the biggest draw is how engaging it is to drive. Base trim levels get 26 mpg city and 35 mpg highway – not bad for a non-hybrid. AWD is optional. Pricing starts at $21,795. What makes the crossover so appealing? Toyota says that when it first introduced the RAV4 in the ’90s, it combined “SUV versatility with car-like handling, ride comfort and fuel economy.” Basically, a crossover is a vehicle that can do it all. The new RAV4 takes this spirit and infuses it with more – more technology, more sportiness with the SE, and more eco cred with the hybrid. I like that Toyota went to such great lengths to refresh the exterior and interior in this mid-cycle update. Even if the styling is not necessarily to my taste, it doesn’t commit the far bigger sin of looking cookie-cutter, either. The cabin is a nice place to be, and the safety technology is spot-on for something in the 2016 model year. The SE trim level promises a healthy dose of sporting intent, and on the surface, I think it works – it handles surprisingly well for a tall, heavy vehicle, and it looks the part too. 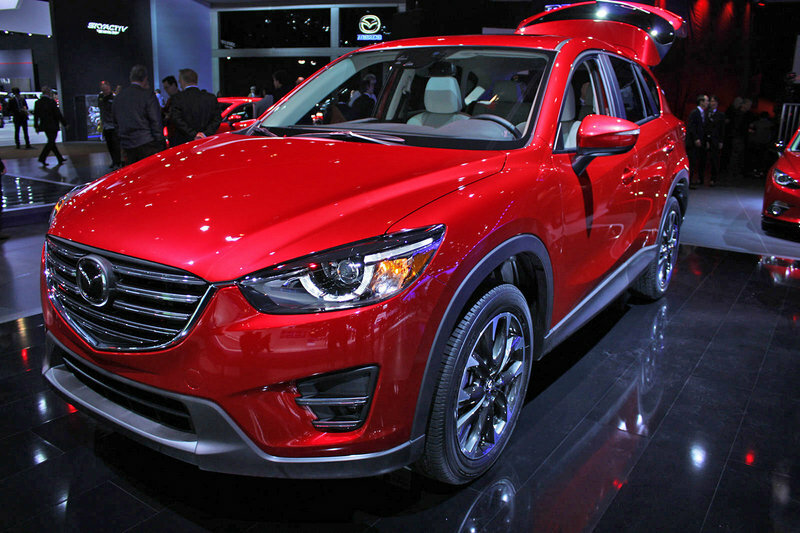 But that’s the thing when talking about “performance-oriented” crossovers – it’ll always have that asterisk of “for a crossover,” and if I really wanted something fun in this segment, it would probably come with a Mazda badge. It’s the best do-it-all vehicle of the bunch, and in that sense, the best embodiment of the original crossover philosophy. Which brings us to the hybrid. With a double electric-motor-wallop in the drivetrain, you get a little more of everything – more acceleration, more towing capability, and more mileage. The drawbacks are minor – hybrid models have slightly reduced cargo capacity and a $700 premium. It’s the best do-it-all vehicle of the bunch, and in that sense, the best embodiment of the original crossover philosophy. Either way, the RAV4 is once again looking to be a huge volume seller with no hint of slowing down. Toyota says it expects to sell over 300,000 models this year, and will expand production to its plant in Cambridge, Ontario, by 2019 in order to fill future demand. The question is – will you contribute to that final total?